Former Manipur minister Digakthui Phianrongdiyang Panmei, popularly known as DP Panmei, passed away on Sunday, following brief illness here. Panmei breathed his last at around 4.30 am at a private hospital in Imphal, sources close to the family of the former minister said. Another source said he was admitted to the hospital on January 23, 2019. He is survived by his wife, two sons, three daughters and three grandchildren. 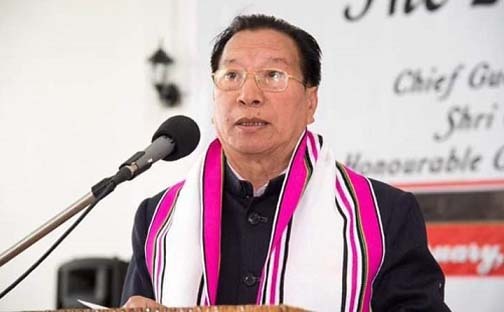 DP Panmei, who hailed from Azuram village under Tousem sub-division in Manipur’s Tamenglong district, was elected from Tamei Assembly constituency in the 6th Manipur Legislative Assembly (1995-1999). he was a cabinet minister in charge of social welfare & health when Wahengbam Nipamacha Singh was the chief minister of the state from 1995 to 1997. Panmei was also elected as a member of the district council from Saramba segment under the Autonomous District Council, Tamenglong from 1984 to 1988 and served as the opposition leader. He was the convenor of the Naga People’s Movement for Human Rights, Tamenglong district from 1993 to 1994). He was the general secretary of Zeliangrong People’s Convention (Assam, Manipur, Nagaland) from 1989 to 1994. Panmei, who also led the Zeliangrong Students’ Union (Assam, Manipur, Nagaland) from 1972 to 1977 as its president, was the founder member of the Naga Students’ Federation formed in 1971. Panmei, who did his masters degree in History from Gauhati University, served as the founder principal of Christian Grammar School, Tamenglong. As a social activist and educationist, he contributed a lot to the society as a whole and in particular for the Zeliangrong community. Panmei, known as the champion of the poor, was involved in various organisations as well as development activities of the Zeliangrong tribe. He tried hard to develop Tamenglong-Tousem-Haflong road as an Inter-State Highway. He also took initiative in its construction with the authorities concerned in 1997. The funeral service of the departed soul will be held at Town Baptist Church and the formal burial ceremony of the Zeliangrong leader will be held at the premises of his residence at Green Hills, located at Tamenglong district headquarters, sources said.